I haven't seen this scene for years. At least in your picture you can see that british chippy sign there isn't a lot of them left today left. Sorry boring Mick. Get out and shoot some wildlife and flowers in our parks, you can see shots like this during winter. You can't win can you Mick? if you post photos of wildlife someone will say "What's that got t do with Wigan?" 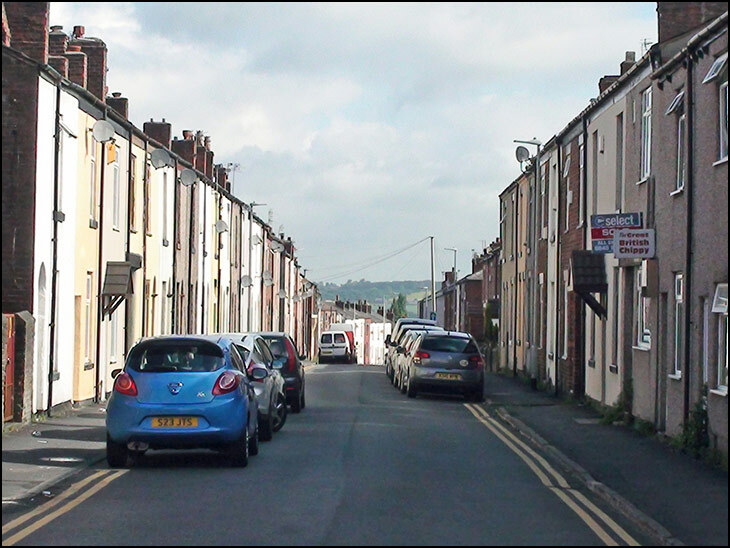 post a photo of a Wigan Street and you get told it's boring! well I like the photos as I walked down there many a time although I can't remember it being on a hill. I always assumed Loch Street was in Pemberton! Nice one Mick .Most people just walk down a street and never notice what is going on around them building wise. When these houses were built in the 19th century who could have foreseen the rows of cars on each side? The odd horse and cart -yes clattering over the cobbles -hidden under the tar-mac and children playing in the "cart road"! I may be wrong but is the view in the direction of the junction with fleet st/city rd? That end quickly dropped off to the hill down city rd, I've not seen this street in many years. Went to Lamberhead Green school and walked the short distance from school (can't remember that street name) the turned left into loch street and down the hill (city rd) everyday. Fit as a flee then, infants at St Johns, up and down the hill every school day and juniors at Lamberhead Green, up and down the hill every school day. Move to a prefab in Green Hey and took the short cut then, through infants at top of green hey, up the side of the school field then up the track at the back of the houses past the aroma of fresh baked bread at the bakery and out to orrell rd and on to Abraham Guest School. All the walking done hail or shine. One of many childhood memories which a simple photo of loch St can prompt a recall. That chippy has not been open for 6 months, in fact nobody has made it work. Unless that's down to the people being tight. Thanks Barryh for that info.